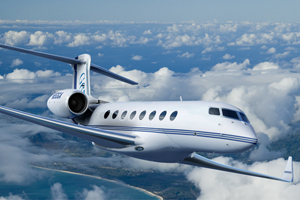 CORONA, CA, September 20, 2008 – CIRCOR Aerospace, Inc. (NYSE: CIR) was selected to supply the Fire Wall Shut-Off Valve and Main Entry Door Damper for the Gulfstream G650 aircraft. This all-new business jet offers the longest range, fastest speed, largest cabin and the most-advanced cockpit in the Gulfstream fleet. CIRCOR Aerospace, Inc. has a long history of supplying its Circle Seal Controls line of electro-mechanically actuated valves to the aviation market. The Firewall Shut Off-Valve is an extension of the existing product line with improvements in weight and reliability. The Main Entry Door Damper marks the first actuation device CIRCOR Aerospace will supply to Gulfstream. CIRCOR Aerospace, via its LOUD product line has over 30 years of experience designing and manufacturing actuation devices for the aerospace and defense markets. CIRCOR Aerospace, Inc. (CAI) is a CIRCOR Aerospace Products Group company focused on the design, development, and manufacture of specialty fluidic control systems and aircraft landing gear systems for demanding aerospace and defense applications. CAI provides a full range of check, relief and electro-mechanically actuated valves, actuation systems, manifold assemblies, and complete landing gear systems. The motor operated, hydraulic Fire Wall Shut-Off Valve and Main Entry Door Damper contracts are in excess of $3 million for the Gulfstream G650 business jet and were finalized this week.